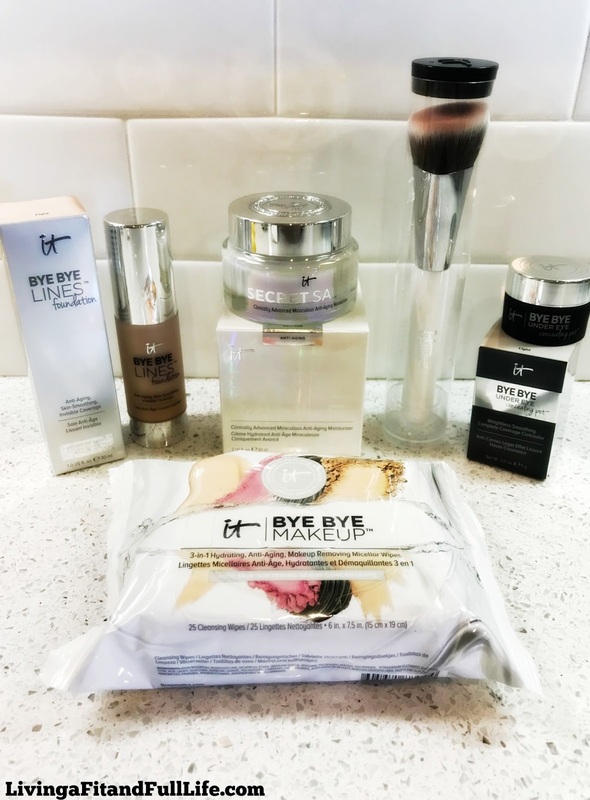 Living a Fit and Full Life: Freshen Up with IT Cosmetics for a Beautiful You! Developed with plastic surgeons, Bye Bye Makeup Micellar Wipes feature the benefits of your best-selling Bye Bye Makeup Cleansing Balm—packed into perfectly portable, disposable wipes! With just one wipe, you can treat your skin to a hydrating, sulfate-free micellar cleanser, purifying instant makeup remover and anti-aging serum. Infused with proprietary Skin-Softening Serum Concentrate, these revolutionary wipes soothe and refresh while removing all traces of makeup. Your skin is left feeling clean, hydrated and soft. Gentle enough for your delicate eye area and even the most sensitive skin, Bye Bye Makeup Micellar Wipes are your must-have for at home—and on the go! Discover how great brushes give you great-looking skin with your Heavenly Luxe Bye Bye Foundation Brush #22. Featuring a unique triangle-shaped brush head that reaches every corner of your face for your most even, streak-free application, plus a soft-touch handle, it’s so easy to use it truly does the work for you. Perfect for even the most sensitive skin, the ultra-plush, award-winning Heavenly Luxe brush hairs are cruelty-free, animal-free, pro-hygienic and won’t shed! This innovative brush pairs perfectly with your skincare and color-infused skincare—especially your Bye Bye Foundation Full Coverage Moisturizer™ with SPF 50+—for your most flawless, airbrushed finish every time. Freshen up with IT Cosmetics for a beautiful you! IT Cosmetics has done it again. They've come out with a few new absolutely fabulous products that are sure to help beautify your skin. You're sure to love them! Bye Bye Makeup 3-in-1 Wipes are my new favorite way to remove makeup and dirt at the end of the day! I love how easily they remove every trace of dirt, oil and makeup from my face. I also love how gently they do it. Bye Bye Makeup 3-in-1 Wipes leave my skin feeling fresh, soft and clean all while leaving skin perfectly hydrated. Bye Bye Makeup 3-in-1 Wipes are a fabulous way to cleanse skin! 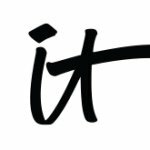 Secret Sauce™ from IT Cosmetics is a secret I'm oh so glad IT Cosmetics decided to share! Secret Sauce™ immediately hydrates and transforms your skin. It feels absolutely heavenly on my skin and leaves my dry skin instantly healed and refreshed. Secret Sauce has left my skin looking more hydrated than ever and has even helped me look years younger. 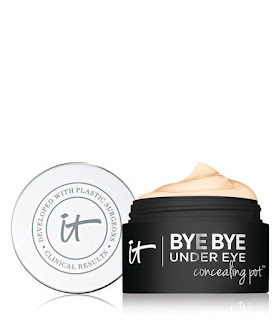 Bye Bye Under Eye Concealing Pot™ is this mom of fours secret for looking well rested! It conceals like none other leaving my eyes looking younger and healthier than ever. It blends evenly and quickly conceals my dark under eye circles with ease. I also love that it doesn't settle into my fine lines and leaves me looking bright eyed and bushy tailed! 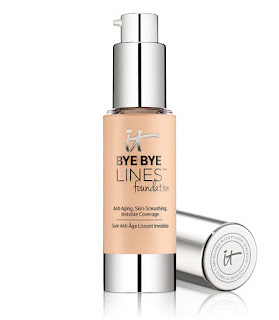 Bye Bye Lines™ Foundation is the perfect foundation! I've entered into my 30's and now the fines lines are starting to creep up. I absolutely love that this foundation doesn't settle into my fine lines and blends extremely well. It's the perfect foundation for any occasion! 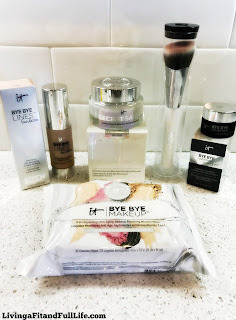 Heavenly Luxe Bye Bye Foundation Brush #22 is amazing! 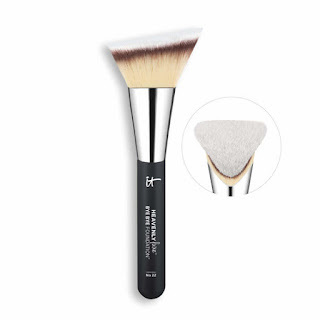 This brush features a unique triangle-shaped brush head that reaches every corner of your face for your most even, streak-free application, plus a soft-touch handle for added comfort. It leaves behind a perfect airbrushed finish and blends like a dream! It's a totally amazing foundation brush that you will absolutely love! IT Cosmetics are the perfect way to freshen up and beautify your skin!